Meet the Yamabushi, a group of alpine ascetics who are opting out of the rat race and reconnecting with nature. 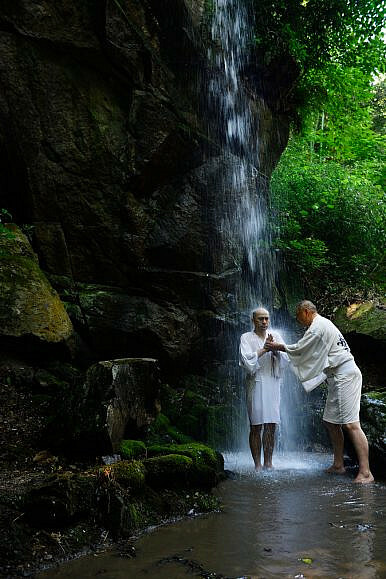 Standing under a torrent of ice-cold water spilling over a rocky cliff in the mountains outside Tokyo, a man in his early 40s clasps his hands together. Clad in nothing more than a white loin cloth, he chants a mantra for more than half a minute, frigid water cascading over him. His peers, dressed in white robes, stand nearby and watch on. They cheer when he completes the ceremony and mentally prepare themselves for their own turn under the falling water. 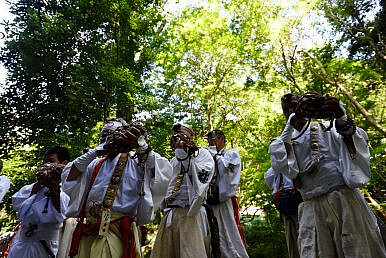 Meet the Yamabushi (“one who prostrates upon mountains”), devotees of a mystical tradition with a unique place in Japanese spirituality. They are pursuing enlightenment through communion with the natural world and the supernatural forces running through it. At its core, they follow Shugendo, a syncretic system of belief that essentially means “the way of testing and training,” Alena Eckelmann, a Yamabushi practitioner from Germany, told The Diplomat. This desire to meet nature with all of one’s senses may appeal to weary city slickers today, but the Yamabushi tradition stretches back to the sixth century CE. During that time, ascetics wandering in the mountains began to blend elements of Shinto, esoteric Buddhism and Taoism, formulating what we know as Shugendo. A colorful cast of characters emerged in this milieu, from lay practitioners and hermits to wandering holy men, exorcists and healers. Most refrained from marriage in the early days, but gradually the Yamabushi community diversified into various sects and some began to raise families according to their chosen tradition. From the 12th century to the Meiji restoration in 1868, Shugendo was a major spiritual movement in Japan. One study found that more than 90 percent of village shrines in the northern region of Honshu were served by priests with Yamabushi ties during that period. Although it was traditionally reserved for men, she added, “Recently I see more women. This is probably because the two big centers for Shugendo, Kimpusenji in Yoshino and Dewa Sanzan, have opened up and allow women practitioners.” In addition to women, she said that younger foreigners – mainly academics in their 30s – have also began to show more interest in Shugendo over the past decade. Eckelmann’s own journey to Shugendo began after she wrote a story about Yamabushi for the now defunct Tokyo Journal in 2008, piquing her curiosity. She was living in Tokyo at that time, but decided to move to the Kii Peninsula in the summer of 2011 to undertake more serious training. Whether foreign, Japanese, male or female, before Yamabushi head for the mountains, they gear up. Their iconic uniform includes straw sandles, Buddhist rosary beads, robes of various hues (white, saffron, tan, blue, sometimes checkered), sometimes a conical hat made of woven wood slats, and other times a black pillbox cap that serves as both protection and a drinking cup. Some also wield conch-shell trumpets. And almost all of them carry walking sticks to ensure balance in the rugged terrain. 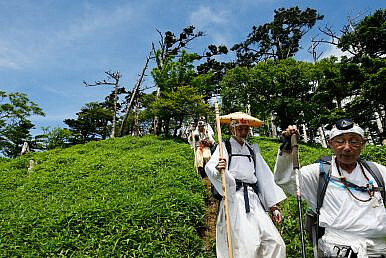 On any given weekend, small groups of Yamabushi can be seen plodding up steep trails select areas of Japan. As they ascend, they often chant in unison: “Sange, sange, rokkon shojo.” (“I repent, I repent, purify my sixth sense.”) The intensity of the journey reinforces the conviction of the words. And the physical test of endurance is critical to their practice. The list of ordeals that Yamabushi endure are many. They also battle sleep deprivation, walk on hot coals and (as described above) subject themselves to immersion in icy mountain water. During periods of ascetic discipline, they also adhere to a strict diet consisting almost entirely of mountain vegetables. While it may not make for a relaxing weekend, some temples now hold occasional Shugendo “tasters” for the curious. The reasons to desire experiencing something so arduous are as numerous as the weary weekday warriors who want to explore Shugendo. Banri Tanaka, an Osaka-based photographer, discovered his interest almost by accident. Tanaka’s down-to-earth account has the distinct ring of truth. Many have a similar experience of gradually awakening to the deeper meaning of the Yamabushi path. After all, it is a journey.